"A father will do anything to save his daughter's future." Sundance Selects + IFC Films have debuted the official US trailer for a film titled Graduation, made by acclaimed Romanian filmmaker Cristian Mungiu. Mungiu won the Palme d'Or at Cannes a few years ago for 4 Months 3 Weeks and 2 Days, and this new film also premiered in competition at Cannes last year. Graduation (or Bacalaureat in Romanian) is about a father and his daughter, who is just about to graduate and go to a university in the UK. But an attack against her jeopardizes everything. It's a complex film about compromises and the implications of the parent's role. The cast includes Adrian Titieni, Maria Dragus, Rares Andrici, Lia Bugnar, Malina Manovici and Vlad Ivanov. This received fairly positive reviews at Cannes, but it's not better than Mungiu's other films. Romeo Aldea (49), a physician living in a small mountain town in Transylvania, has raised his daughter Eliza with the idea that once she turns 18, she will leave to study and live abroad. His plan is close to succeeding - Eliza has won a scholarship to study in the UK. She just has to pass her final exams - a formality for such a good student. On the day before her first written exam, Eliza is assaulted in an attack that could jeopardize her entire future. Now Romeo has to make a decision. There are ways of solving the situation, but none of them using the principles he, as a father, has taught his daughter. 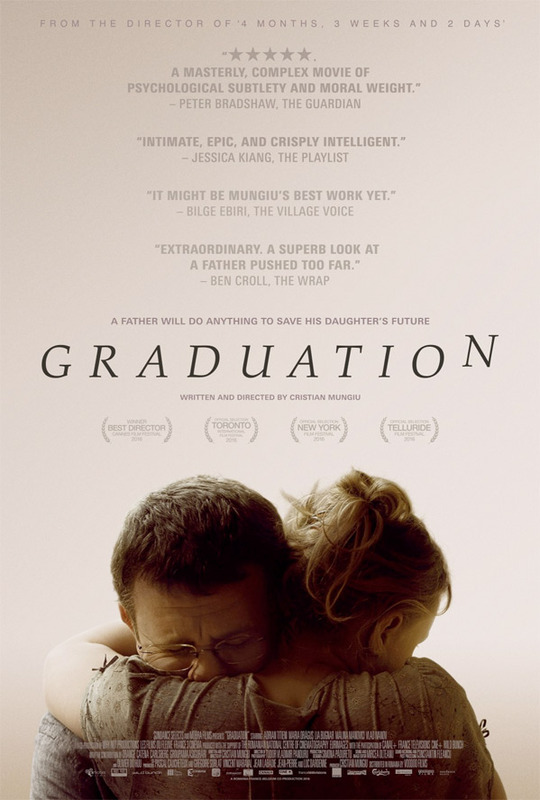 Graduation is written and directed by Romanian filmmaker Cristian Mungiu, of the films Occident, 4 Months 3 Weeks and 2 Days (Palme d'Or Winner), Tales from the Golden Age, and Beyond the Hills. This premiered at the Cannes Film Festival last year. Sundance/IFC opens Graduation in limited US theaters starting April 7th.